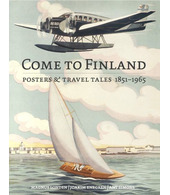 After the Continuation War, the graphic designer Osmo Walli enrolled at the Central School of Arts and Crafts. His first job was as a commercial artist for the department store Sokos. Soon Sokos’ main competition, the department store of Stockmann, became interested in the young artist and in December 1955 Walli started working for them as manager of the advertising department. From the 1970s onwards, he worked solely for Stockmann’s in graphic design until he retired in 1988. In his free time, the multi-talented Walli found time to work on, among other things, illustrations for book jackets, posters and sports badges. One example of his work is the lion’s head that could be seen on the shirts of the Finnish ice-hockey team during the 1970s. Through his friend, the magician Solmu Mäkelä, Walli became head designer for the interest group Suomen Taikapiiri ry. He has also illustrated Mäkelä’s book about magic, Suuri taikakirja. Osmo Walli has also established himself in musical circles as a skilful drummer. Since 1945, he has played in many different orchestras and bands, among them the Martin Brushane Big Band.